After a really great Studio Saturday in August, I was inspired to create a theme for September. I've watched so many of you have the courage to step outside of your comfort zone in the last several months. Studio Saturday was no exception! This month’s theme is “Try Something New,” and I’m pretty excited about it. I wanted to start the month by telling you my story about when I started painting larger pieces of furniture. (Now it’s the middle of the month, and I haven’t shared this story!) I hope that it can maybe help even just one person out there. I am my own worst enemy. Most of us are. We have voices inside of our heads that prevent us from doing things we have the potential to REALLY love and enjoy. Sometimes those voices don’t even have words. They’re just icky feelings we don’t understand. For me, a lot of those feelings are based in fears and doubts of my own abilities. So much of being creative is about getting past doubts and fears of trying new things, and that can be really challenging. Wait. Creative, you say? 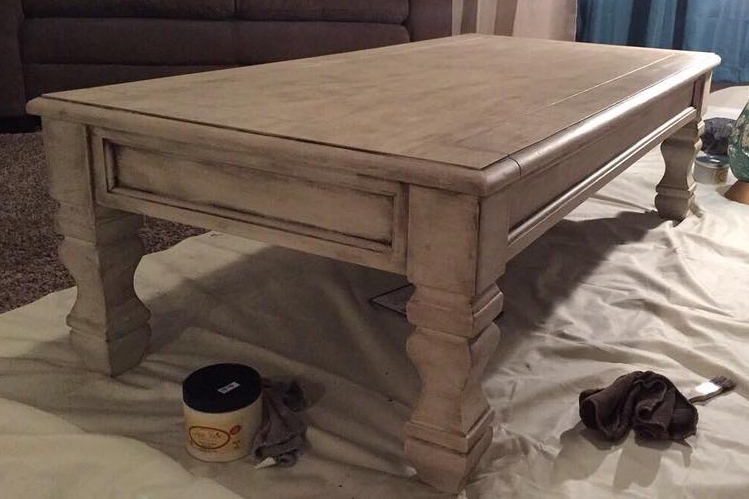 I just want to paint my end table, lady—not paint my version of the Sistine Chapel ceiling. Here’s the thing, for some of us, painting our first table IS our Sistine Chapel. Y'all, I've been there. After a couple of mediocre experiences painting some smaller furniture, I didn't think I could paint furniture and make it look pretty, so I stuck to painting lamps, picture frames, and other smalls. If you came into my shop shortly after I opened and asked me about the painted items in the shop, you likely heard me say some version of "Yeah, my mom paints the bigger furniture pieces. I like to stick to smaller things..." I’m sorry, y’all. I lied. The truth: I was VERY afraid. Eventually, though, I grew bored painting smalls and wanted to do more. At the time, I had a pink kitchen cabinet in the store, and I was tired of looking at it. 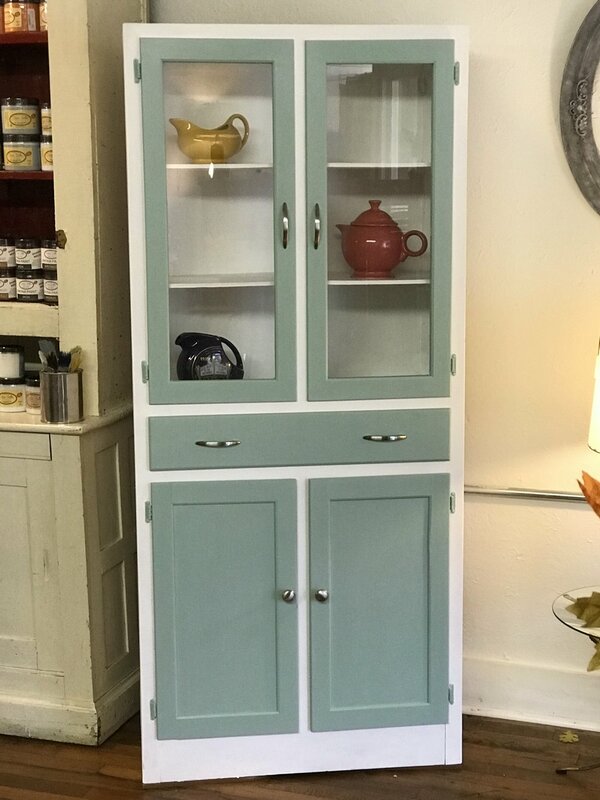 I kept saying "I'm going to paint that cabinet" to anyone who would listen, but something held me back still. I realized I was looking for someone to give me permission to paint that piece. What?! It was MY cabinet. Why did I need permission? I didn't need anyone’s stamp of approval on what I did to that cabinet. I could've taken it out back and set fire to it if I wanted. That probably wasn't the best idea, but it was MY cabinet. The reality was I wanted permission so I could feel safe enough to step out from behind my fears of making a mistake—all because I was getting ready to do something new. There are many times in my life fear of the unknown has crippled me, especially in the years I've owned my own business. It still trips me here and there, but I try to overcome it with what I learned from that cabinet and all the pieces since: if I don’t decide to step out of my comfort zone and leave behind my fears, there are WAY too many good things I might not experience. If I hadn’t decided to paint that cabinet, I would still be painting frames and lamps, and Uptown Downtown might not still be here. I wouldn’t have found the passion I now have for painting. If you want to try something new and you face a bunch of fear and doubt in your mind, I encourage you to decide to face those feelings. I encourage you to gather some confidence by painting something small, even painting a few smalls. Eventually, you’ll find the resolve to paint that end table. If you want to put something bright green in your dining room, but you’re hesitant, start small and TRY it! If you want to try to paint something and sell it for profit, give yourself permission! All of these things could be incredible successes for you, and if they aren’t, there’s ALWAYS more paint! I invite you to the shop this month to try something new. Studio Saturdays on Saturday, 9/22. This is a SUPER fun, casual chance to try new-to-you products, learn a different painting technique, or whatever you want! On Saturday 9/29, you can come paint a piece with me start to finish. You get to experience Dixie Belle Paint firsthand and learn about furniture prep and repair, and more. The link below will give you all the details! Last month we held our first Dixie Belle Paint workshops. Yay! I was so nervous, but I survived, and most importantly, I think everyone had a great time. Our March schedule is in full swing, so if you want to come and paint with us, we have several workshops available! Furniture Painting 101 workshop will teach you all the need-to-knows of using Dixie Belle Paint to finish furniture and other items. We'll also cover basic furniture repair and a bevy of other topics related to using chalk mineral paints. You'll leave with everything you need to know to use Dixie Belle Paints on your own furniture. This month I'm launching a more advanced workshop where you'll get to try a whole range of Dixie Belle products that will help you make your pieces "pop." It's called "Creative Chalk Finishes," and during the workshop you get to use glazes, waxes, and metallics that will allow you to create vintage and antique looks and layered effects. Creating that final finish is my absolute favorite part of using Dixie Belle, and I'm sure this will be a fun workshop! Our class space is very limited, so advance registration is required for all workshops. You can register online by clicking on the button below, visiting the shop, or by calling us at 681-539-3506. Finally! Come learn to paint with us! If you haven't figured this out about me yet, I LOVE to paint. More than that, I love to talk about painting and decorating. SO it is with great excitement (and anxiety) I launch two things at once, a new blog about painting, upcycling, and vintage décor and Uptown Downtown's NEW Dixie Belle Paint workshops!